Halloween Horrorscapes is a very interesting case. Although it’s an album of soundscapes, there’s just enough music in it to keep it from being your typical scary sounds CDs. Also separating it from the usual Halloween fare are its intense, not entirely kid-friendly nature and its use of layered sound. While not 3D audio, it does provide depth to the tracks. For example, things are heard in the distance in several tracks, while storm sounds become muffled when one soundscape enters a house. Sonic Realm also has the distinction of being one of the few groups in “Music to Haunt By” to have their work featured on Music Choice’s “Sounds of the Seasons” channel every October. Things kick off in “Stormy Awakening (The Dark Forest),” which starts off with the sounds of a storm in a spooky forest. It’s an inverse of most songs featured in this series, with sound effects dominating lightly-used (but effective) music. The sounds of rain and thunder are constants, as are cawing birds, screams, evil laughter, fire and chainsaws. These are only a mere smattering of the sounds you’ll hear, as there are for too many to document. As for the music, there are some great drums and piano work, especially during the “guy running and later being torn apart by wolves” segment. While you might not think the sound of a falcon would fit in with scary sounds, this track proves you wrong. That said, there are some sound effects that seem out of place in a haunted forest, such as electrical equipment zapping. That said, the overall soundscape transitioning seamlessly into “Blood Hunt,” which has great drums at the opening. In addition to the wolves, rain and chainsaws heard in the last track, this one offers up many new effects, like ghosts, monsters and creaking doors. There’s also “heavy” music in the background at times. The album has mixed bag of screams. Some are great sounding classics you’ve heard elsewhere, some appear to have been recorded especially for this album, and a few others seem a bit off to me. But that is just my opinion, your mileage may vary. In fact, I suggest that you check out the official album samples on Amazon and iTunes before making a decision. In short, Halloween Horrorscapes is an amped up version of those spooky sound effects CDs you find everywhere come October. All the tracks are suitable for looping and transition into one another seamlessly. Do the soundscapes stick entirely to the theme suggested by the titles? Usually no. Will it scare kids? Yes. Hell yes. While I would have preferred more of an adherence to the theme suggested by the titles, that doesn’t mean you can’t use the tracks in a haunted house. For example, you could use “The Headless Horseman” in a room divided up into sections featuring the Headless Horseman, a gravedigger and a monster eating someone. Alternately, you could have someone in a “control center” stop the track just before it reaches the point where its starts sounding the way that doesn’t fit your haunt. If you do an old fashioned “touch ‘n feel” haunt with a blindfolded patron, then the tracks can work perfectly. You could lead someone through a “haunted forest” (dimly lit room with leaves and twigs on the floor) while playing “Stormy Awakening (The Dark Forest)” and “The Headless Horseman,” explaining that the forest is filled with mutations and equipment from a mad scientist. After entering the scientist’s castle (a doorway with threads hanging down, using one of the many tracks featuring a person entering a house), they can be led to the lab to inspect body parts (the blindfolds being used to protect the mad scientist’s identity) while “The Lab Experiment (A Rebirth)” plays. During the chaos, you tell your patron that the doctor is gathering more parts as “Killing Spree” plays (while flicking your wet fingers at them to simulate blood splatters) before you take them to a room where they can remove the blindfold and wash their hands. I am also aware that many people like to cram as much spooky stuff together as possible in yard displays and haunted houses, and don’t necessarily care about how realistic such a grouping is. Halloween Horrorscapes is perfect for such setups. In a way, this album also hints at the future of “Music to Haunt By,” as next year’s installment will be called “Music to Haunt By and Sounds to Scare By” since the amount of spooky ambiance albums seems to be fading while the number of spooky sound effects albums is increase. 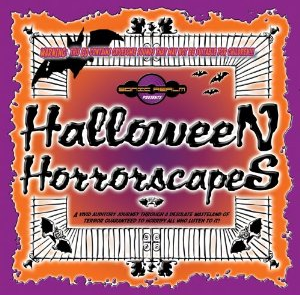 While not your typical ambiance album, Halloween Horrorscapes is definitely work picking up. Special thanks to Sonic Realm for the review copy!